JetBlue, darling of the budget-minded leisure traveler, has taken another step toward the lucrative business travel market. According to Travel Weekly (free registration required), the low-cost airline plans to test a new system whereby business travelers will be able to purchase refundable tickets that would have the added benefit of a guaranteed aisle or window seat. The seat component of these new fares is related to the way business travelers make their travel plans. Because they often book tickets just days before departure, business passengers tend to get stuck with JetBlue’s remaining inventory, usually comprised of undesirable middle seats, says Tim Luceno, the airline’s manager of national sales. 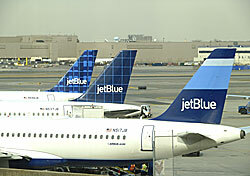 Combining refundability with better seating would certainly improve JetBlue’s appeal to corporate travelers. JetBlue has been courting business travel for some time now, with moves such as last fall’s decision to sell tickets on Travelocity.